And here he is in all his pewterific glory, courtesy of the guys at Otherworld. Legends tell of a battle between good and evil that lit the sky with arcane colours, scorched the earth, melted stone and left a legacy of horror that has endured for centuries. 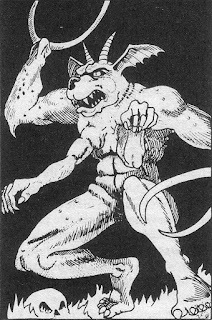 It’s not quite that bad; a Type III demon (the one with the pincers and the dog head) was taken on by a party of high-level adventurers and defeated but not destroyed. The catacomb in which it was fought became its prison; powerful sigils and wards were used by the survivors of the fight to ensure that it remained there for the rest of their lives (their descendants were on their own). To be fair, the catacomb sealing was done well and has lasted for a lot longer than the party envisaged. 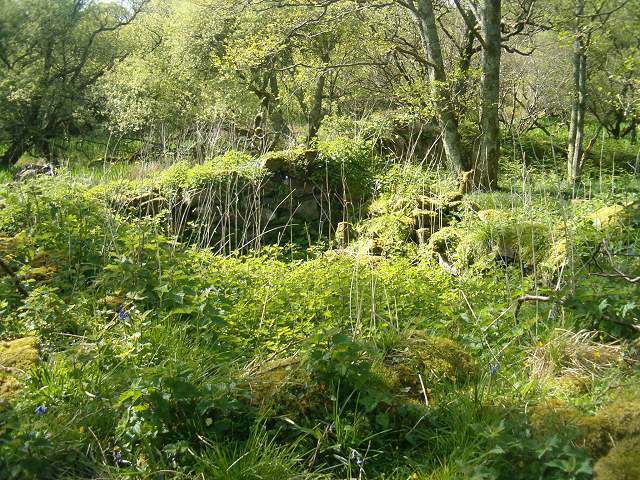 Now, many years later, the catacomb and the buildings above it have crumbled and collapsed in on themselves, whilst the countryside around it has become wooded and covered with thick undergrowth. Nothing lasts forever, and this goes for the wards imprisoning the demon. They have started to break down and the evil influence has begun to corrupt the vegetation in the area, causing death and injury amongst the locals who now shun the area (so no chance of hiring henchmen from that source). The party will be drawn into this lovely little scenario by getting wind of an artefact of great power that lies within an old abandoned chapel. Over the years, this is how the legend of the demon has been corrupted by folk tales and oral history. 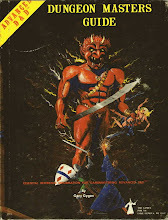 The DM, if desired, can embroider the setting with hints of this for several sessions ahead of time. Perhaps old illuminated manuscripts, travelling bards with stories of the Lost Chapel with its incredible treasures, even a Sleeping Beauty legend might have been invented to explain the corrupted vegetation that surrounds the old catacomb. 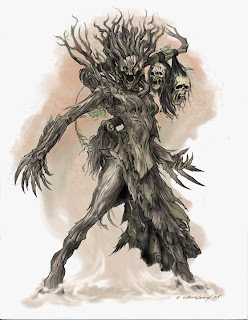 Whatever happens, the party will doubtless wish to investigate and to do so, they will have to hack their way through everybody’s idea of a cursed forest, complete with evil and undead Ents, tree spirits, yellow musk zombies and carnivorous plants, etc (see below). If they make it to the chapel (and let’s face it, those who chicken out at some nasty trees don’t deserve treasure of any sort) then they will probably be able to force their way in with little trouble. Indeed, the sheer force of breaking into the catacomb will probably destroy the last of the wards. 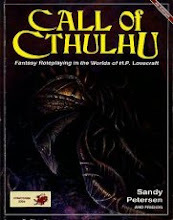 Inside, the tunnels and passageways may well be littered with the leftovers of the demon’s entrapment, which can provide an excuse to scatter the treasure about so that the party has to pick it up as they go along, rather than it being neatly stockpiled in one place. Bodies of former adventurers who came to grief in the forests can also be a source of loot. When the demon finally gets free, it will be very upset and may, in its confusion, think that the party are the same ones who imprisoned it. Be sure to give them very little chance to set the record straight! A few suggestions for the sinister and twisted vegetation that dwells within the radius of the catacomb. I’ve taken some of these from other sources and adapted them, giving credits where possible. Yellow Musk Zombies can be found in the Fiend Folio. There's something not quite right about this wood. I feel it. The corrupt forest will be a network of dead-end tracks, thickets of thorn devils, boggy areas that may well be home to will-o-the-wisps, mists that rise from the quagmires and reduce all visibility to virtually nothing, as well as the stench of rotting vegetation, the sound of raucous croaking and the harsh laughter of crows that lope slowly through the branches of the gnarled and twisted trees. The damp air will mean that torches will be harder to light and rations start to turn mouldy within a short period of time. "Treebeard? A pussycat compared to me." 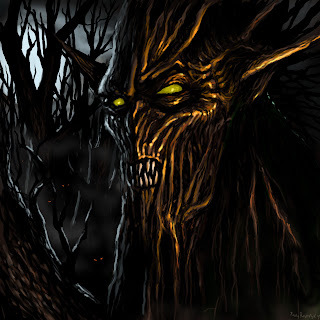 Young evil ents can strike with their branches, causing 2d6 damage per blow landed. The mature specimens will do 3d6 per strike and elder evil ents do 4d6. Any weapon or attack based on fire will receive a +4 on the attack roll. Saving throws against fire-based attacks and spells are made at –4. Each evil ent can command two living trees within 60 yards. 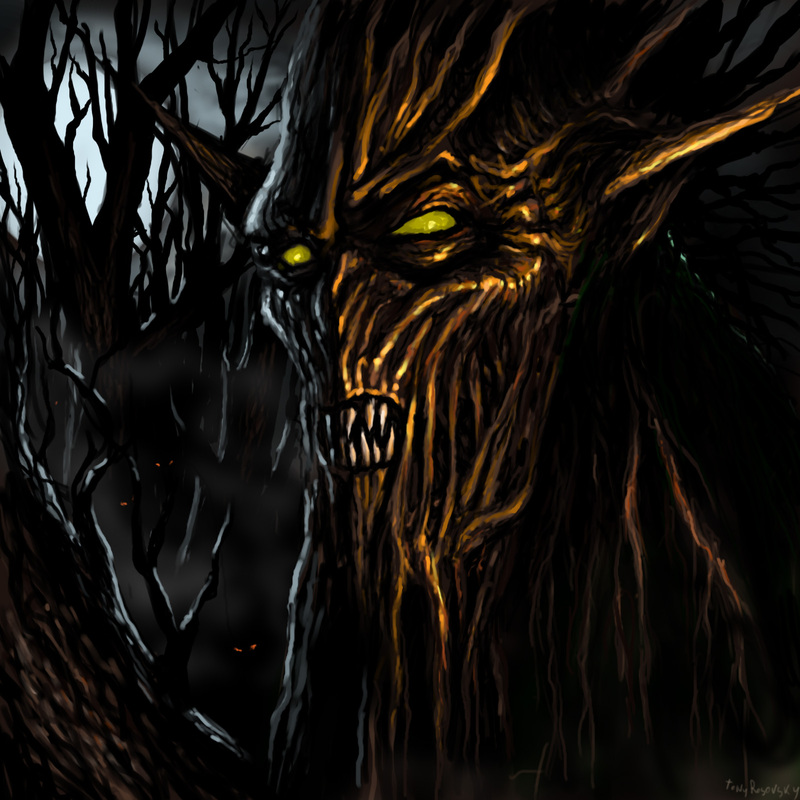 Evil ents like to devour living creatures, especially the flesh of innocents. The Undead ent strikes with its branches, doing 5d6 of damage with each successful blow. On a natural roll of 19 or 20, they have knocked out or stunned their victim for 1 round per 5 points of damage inflicted. If it is not otherwise occupied, the undead treant will move itself alongside the victim and feed off his or her blood. This is done by sprouting 3d4 root-like appendages which will inflict 1 point of damage each as they burrow into the victim’s flesh and thereafter 1d3 of blood is drained each round for every root that is draining. The victim, being bound by the undead ent, will be unable to free themselves except with the aid of a third party. The roots are AC5 and a successful hit will sever one root. If all the tendrils are cut, the victim can escape in two rounds. If the undead treant stops feeding, either because its tendrils have all been severed or its victim is empty of blood, it needs a full round to become mobile again. 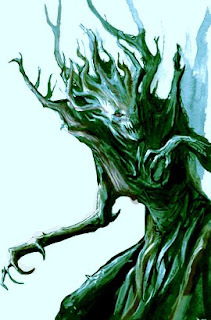 Undead ents cannot animate other trees but its victims, if left where they fell, will rise as zombie slaves of the ent that created them. They can only move 20’ from their master tree but will act as its hands in procuring more victims for its vampiric tendrils. They are also immune to holy water, sleep, charm, hold, sunlight, clerical turning, control undead or plant control spells. I’m not sure about XP. 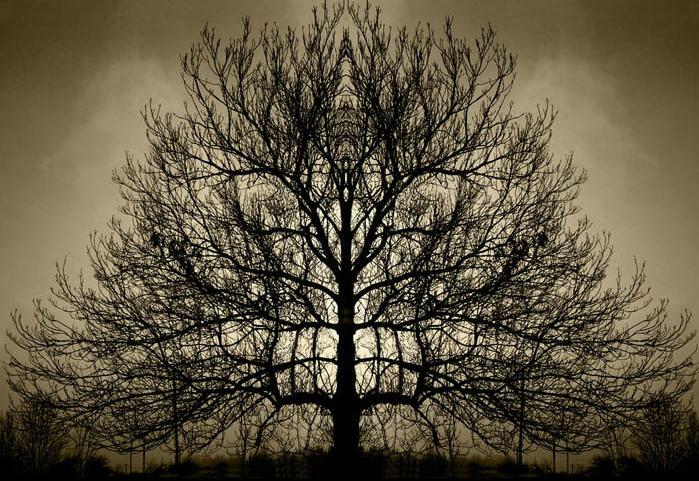 Each spirit is linked to one particular tree from which it can only move a maximum of 3”. It can be dispelled by a cleric of 12th level or higher. Appearing as a 15' tall, spectral, treelike humanoid with extremely long twig-like fingers, it attacks all non-magically armoured targets as if they were AC10. It can only be hit by magic weapons; and has a magic resistance of 10%. In combat, if the spirit scores 5 or more over what it needs to hit, it has clutched its victim's heart with its spectral hands. The victim will then collapse for 1-4 rounds and for each round unconscious will age by 10% of his initial age. Also, for each round unconscious, the victim loses 1 hit point per hit die permanently. If the damage accrued by this exceeds the victim's total, he will die. 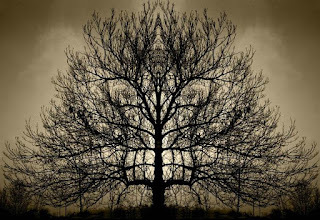 If the body is not removed or blessed, a new tree will sprout from the body; when the tree is fully grown, the damned soul of the victim will appear as a new spirit of the forest. If the spirit drops below 0 hit points, it will flee into its tree where it will regenerate at the rate of 1 hit point per turn. During this time, it and its tree are defenceless. If the tree is destroyed, the spirit is killed forever. This is seemingly normal vegetation that has a variety of flesh eating mouths. Small plants have tiny mouths that do 1d3 damage while large trees have gaping maws that can do 1d12 damage. Limbs writhe and vines curl hungrily, but do no actual damage. Each plant will have 1d4-1 (with a minimum of 1) such mouth. Anyone taking ½ damage (or more) and surviving will need to make a Save versus Petrify and Paralyse at -1 to enter a forest for one week after the encounter. Those who fail the Save will not enter any heavy vegetation and will be catatonic for 1d4 turns. This vegetation has barbed thorns that lash out and attack any creatures within reach, dealing 4d6 points of damage. When rolling to hit for the plant(s), a natural 20 indicates that the plants have wrapped around an individual, causing an additional 1d6 points of damage. There may be poisonous plants within the vegetation and they will inject their poison with the thorns. Those affected will need to make a saving throw versus poison or suffer the effects of the poison as well (an additional 1d4 to 1d8 of damage, up to the DM’s discretion). 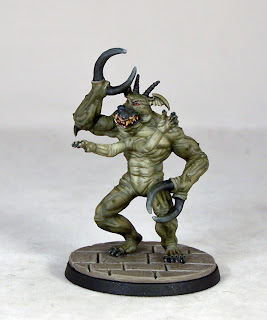 These adventure for every monster posts are great!